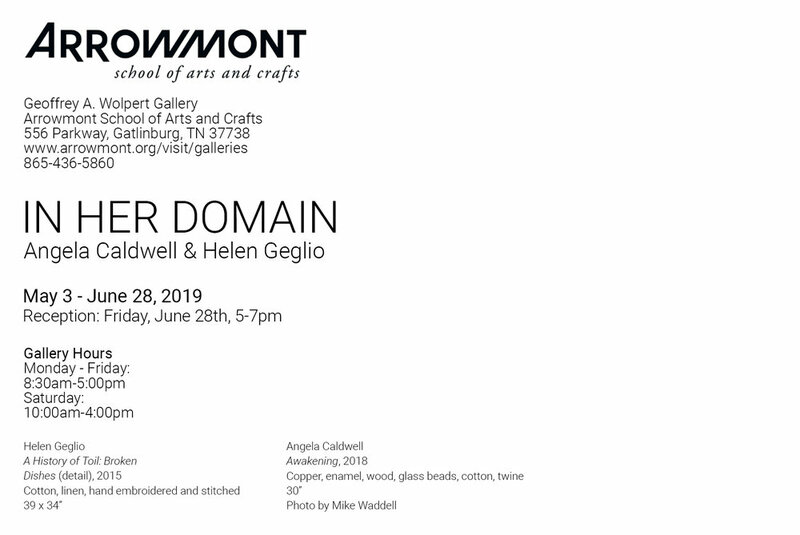 This weekend we are driving to southern Indiana to spend Easter with our son and his family, then on to Arrowmont School of Arts and Crafts in Gatlinburg, Tennessee, to deliver work from my series, A History of Toil, for a two-person exhibit in the Wolpert Gallery with Angela Caldwell. This is the first time I will have more than three works shown at once and I am very excited at this wonderful opportunity. Angela and I both answered an open call for exhibit proposals, and by coincidence, she lives in the same town as my son. We have met several times and gotten to be art friends. 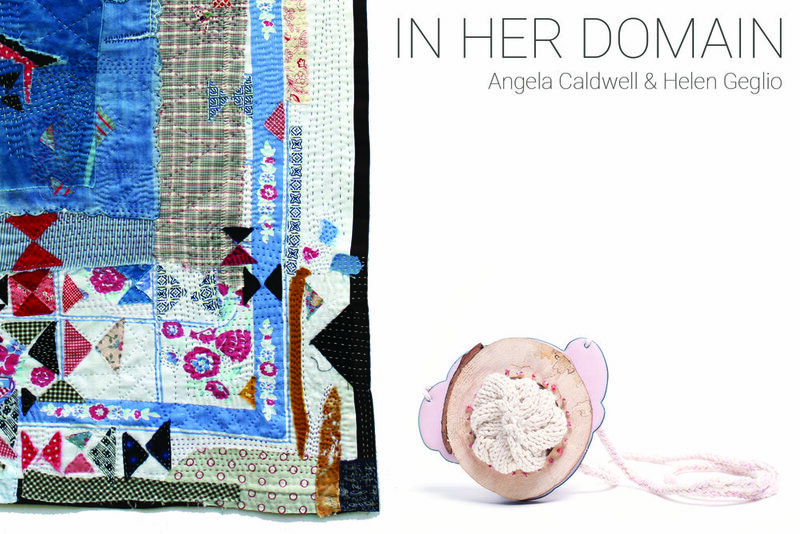 Her lovely jewelry work will be on display with my quilts. I am looking forward to an Appalachian spring trip, I know it will be beautiful. If your travels take you to the Smoky Mountains, please stop in and see the exhibit. I have been working on a new series with a working title of Unbeknownst. I have always liked that word, so archaic and mysterious. 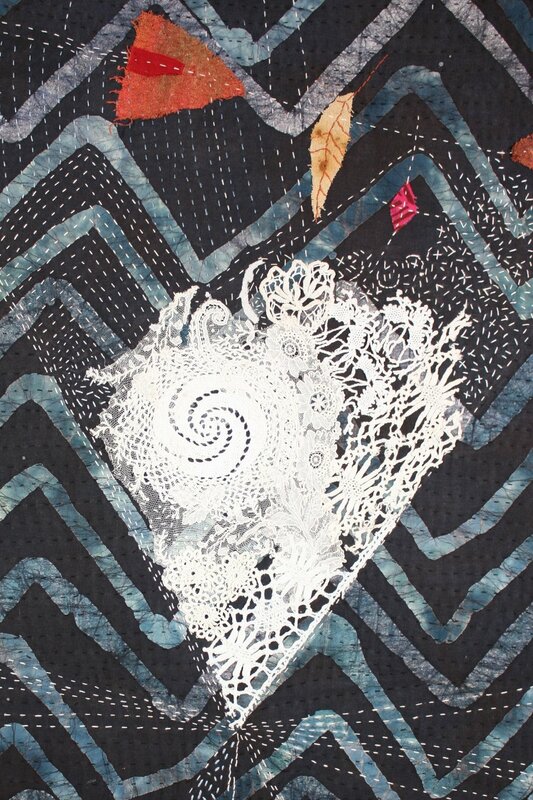 I wanted to use some of my large collection of cast off, abandoned and forgotten handwork, mostly in the form of quilts, domestic linens, hankies and doilies. I am intrigued by the idea of how these objects, so carefully made and saved, end up in estate sales, resale shops and in “mystery lots” on ebay. Maybe once the woman who made or used these lovely things is no longer remembered by anyone, the objects lose value and can be discarded in the process of clearing. This seems to take a few generations. My sister-in-law recently brought me a box of such things from my husband’s three Italian great aunts, maiden ladies who lived together and took care of their mother. The aunts lived into great old age and are now departed, and I have many memories of visiting with our little children, but I doubt any of my kids remember them much. And yet, here I am with these lovely linen napkins, embroidered and monogrammed handkerchiefs and pillowcases, turning them into something else. I heard this bee buzzing in the crocus when I did my first pass of spring raking today. It has been such a long winter. Winter Loon, by Susan Bernhard; Dear Life, by Alice Munro; Bridge of Clay, by Markus Zusak; The River, by Peter Heller; and a blast from the past, Hitchhiker’s Guide to the Galaxy, by Douglas Adams (this is the “One Book Michiana” selection and I got the audio version at the library, read by Stephen Fry—a hoot). This is an exciting opportunity to exhibit with twenty other women artists. Three of my works from the Dozen White Shirts series will be on display. Many thanks to Rita Koehler for her interest in my work and for curating this exhibit. March is predicted to bring more arctic temperatures, blasting wind and generally un-spring-like weather. 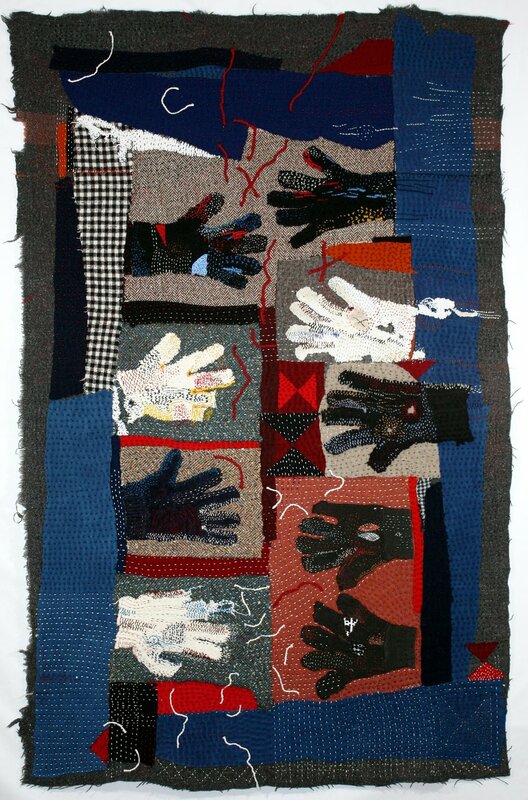 I am using this housebound time to stitch three new pieces about things lost and found, memories of people lost and found too. I had a nice opportunity to give a talk to a local organization about my work last week, and that always helps me clarify ideas that are important to me, and gives me a chance to tell some of the narratives that have informed the works I make. People are always giving me things, and I hit the jackpot when my friend Anna bagged up four very old quilts for me to use as I pleased…I am very much pleased to find ways to use these tattered and well-worn quilts. Thanks Anna. 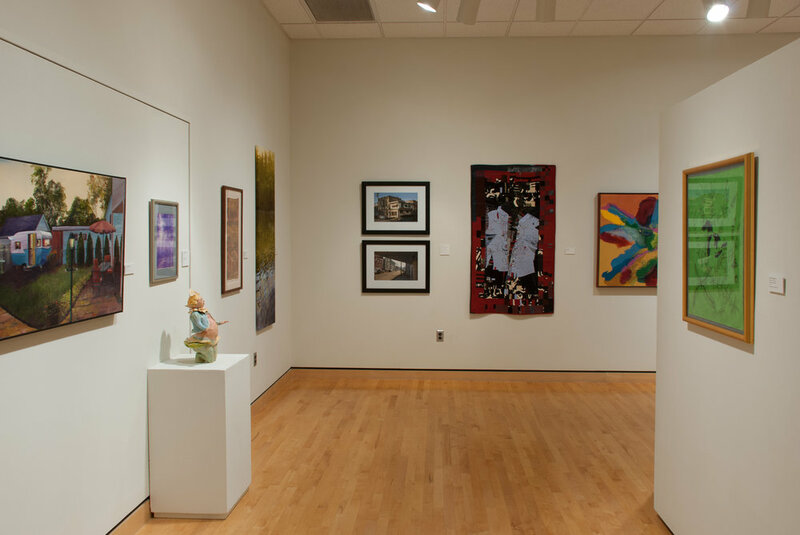 I have another piece, Standing Amazed: Shape Garden 1, showing in Focus: Fiber 2019, at the Kent State University Museum in Ohio. This exhibit runs from March 1- July 28. The Mars Room, by Rachel Kushner; Etta and Otto and Raymond and James, by Emma Hooper; Shell Game, by Sara Paretsky; and the Museum of Modern Love, by Heather Rose (This is an interesting book based on The Artist is Present, the MOMA performance by Marina Abramovic). Heck, it’s colder here than at McMurdo Station in Antarctica. The truth according to Ecobee. Yesterday we woke up late, realizing that the alarm didn’t go off because we didn’t have any power…at -18 degrees. The house was already down to 54, but power was restored after a couple of hours, we dressed in layers and were grateful to the utility workers who got us back on the grid. Everything is closed for cold, so we are hunkered down at home, Mike made a lovely pot roast in the crock pot yesterday, I’ll make soup from same today. Winter is always a creative time for me, no distractions of travel, garden and other warmer weather enjoyments. Friends, Carol Myers and Pat DaRif and I are beginning to put together a body of work from shared materials. Carol got us started with some lovely semi-sheer rust-dyed fabric, I made some cotton and linen solar-dyed pieces, and Pat contributed richly textured fabrics, screen-printed from her original Thermofax plates. I was also interested in using some of the many domestic linens I have collected that had names and monograms on them, the original owners long lost to memory. Here are a few glimpses of my stitching explorations and beginnings. A Lot of Time for Reading. Here are a few titles from my “in the deep of winter” reading binge. Once Upon a River, Diane Setterfield; Our Homesick Songs, Emma Hooper; Clock Dance, Anne Tyler; Little Fires Everywhere, Celeste Ng; The Essex Serpent, Sarah Perry; A Country Road, a Tree, Jo Baker; A River of Stars, Vanessa Hua; Force of Nature, Jane Harper; and Ghost Wall, Sarah Moss. Boxing Day in South Bend is chilly, but sunny. We did not have snow for the holiday, nice for all of our travelers, but not so great for the little baby sled under the tree for our grandson. We have a nice training sledding hill, right in our front yard, so maybe later this winter. A few years ago, The Indiana Women’s Caucus for Art decided to put together an exhibit about threats to the Great Lakes. Several of our members actually live on Lake Michigan, and others on waters close by. The show, Living Waters, took a while to come together, and we had some challenges securing the right venue, but here we are, two weeks out from installation. The piece that I made, Strangers at the Gates, is about the three electric barriers on the Chicago Sanitary and Shipping Canal that separate the Asian Carp in the Mississippi River water system from the Great Lakes. These invasive fish are voracious and a huge threat to the food chain for aquatic life. They would join a long line of other invasive species, carelessly introduced, with unintended consequences to the balance of the Great Lakes ecosystem. Living Waters, opens January 14, 2019, at the Notre Dame Center for Arts and Culture, South Bend, and will close March 22. 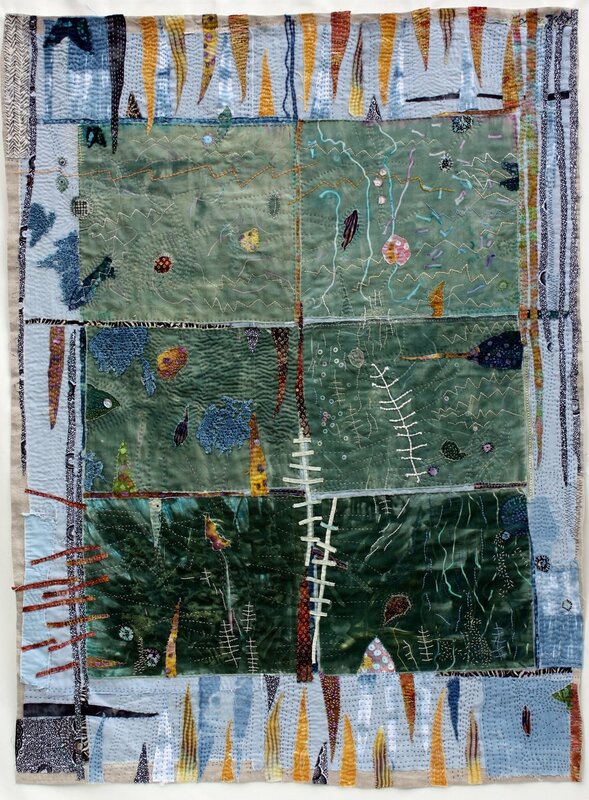 I also have a piece, Coin Op Laundry, in the Art Link Midwest Regional Juried Exhibit, opening January 4 at Art Link Gallery in Fort Wayne, IN. I am closing my 2018 good reads with a few astounding titles: Unsheltered, by Barbara Kingsolver; Virgil Wander, by Leif Enger; and The History of Bees, by Maja Lunde. Other books I have enjoyed, Ways to Hide in Winter, by Sarah St. Vincent; Key to Treehouse Living, by Elliot Reed; There, There, by Tommy Orange; and Longbourne, by Jo Baker. Best wishes for a 2019 that is full of promise and possibility! Opening reception on Friday, November 2, 5-7 PM, and Friday, December 7 for a screening of Clotheslines, a short film by Roberta Cantow at 6PM. 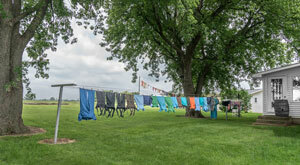 A $5 donation is suggested to benefit Broadway Christian Parish Laundry Ministry. “There is pleasure and dignity in freshly laundered clothes. Laundry is a chore that offers aesthetic enjoyment, yet represents hours of routine toil. It can be a shared experience done in the public setting of a laundromat or on an outside clothesline, or completed alone in a basement or laundry room. In particular, laundry is inseparable from the everyday lives of most women. From the first photo I saw, on the cover of National Geographic, I wanted to see it myself. So, Mike and I headed last week to Chicago O'Hare, then to Miami, then on to Lima, then to Cusco and by train to the Sacred Valley of the Inca, and finally to Machu Picchu. We loved Peru, the people, the places and the food. We traveled with close friends, seeing and learning so much. And none of the four of us suffered too much from the high altitude, drinking plenty of the local remedy, mate de coca. Sometimes it is easy for me to get buried in my studio; cutting, stitching and thinking. It is good to get out into our big, beautiful world, and be amazed and delighted. 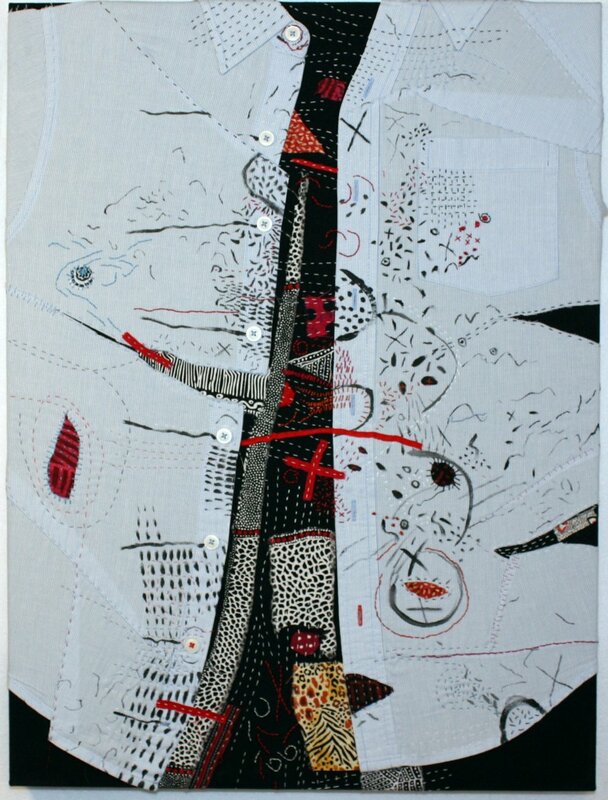 Scrolling through ebay is my secret pleasure, and this unusual quilt top jumped out at me. I bid on it, and before too long it arrived at my door, in "as is" condition. 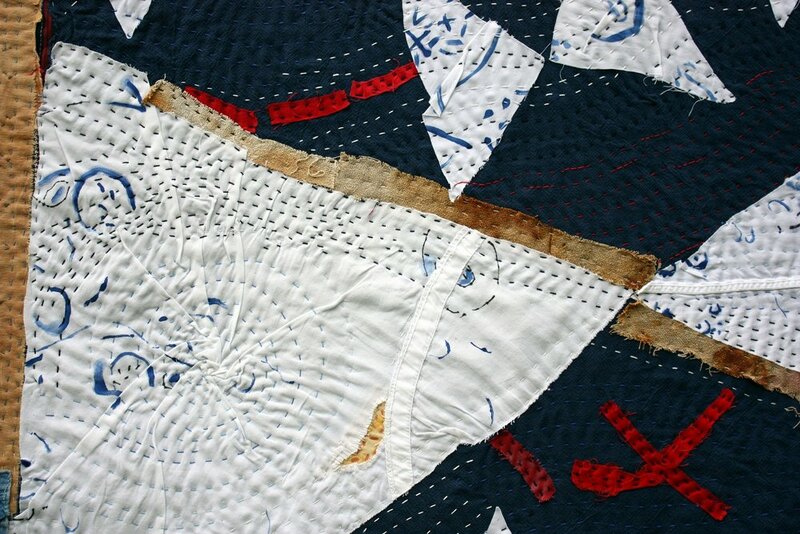 I soon realized that it was paper-pieced, and very musty, with some old indigo and mourning prints. So, I picked the paper off and gave the whole thing a gentle wash. I saved the paper of course...you never know when something like this will be needed. Some of the paper looked like a bus or train timetable, one small fragment mentioned Milk St., Boston. The quilt came from Wichita, Kansas. It looks like someone put together the beginnings or leftovers from several different projects and said "good enough." Yet, it was never made into a finished quilt, so maybe not quite good enough? We'll never know, and that is what intrigues me about using repurposed textiles in my artwork. I am able to imagine new narratives in old cloth. I don't know where I will take this, but I am thinking about it. I have two small pieces from my Out Loud series showing in South Haven, MI, at the South Haven Center For the Arts this fall. 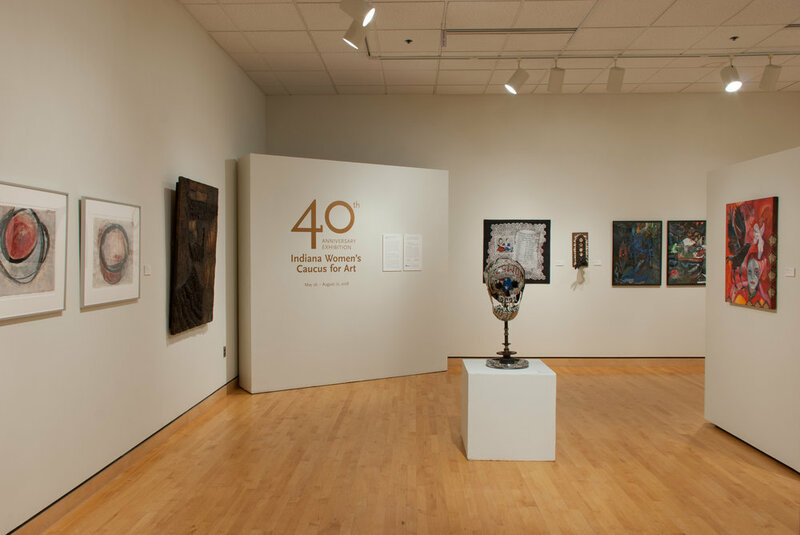 The exhibit is called WITH (re)PURPOSE, and will be on display from September 13 through November 3, 2018. My piece, Outspoken, is included with the works of 20 IWCA members at the South Bend Museum of Art. The Burgess Boys, by Elizabeth Strout; Across a Hundred Mountains, by Reyna Grande; Before Mars, by Emma Newman; and Cloud Atlas, by David Mitchell.